Non Alcoholic & High Fiber Drinks for Digestion – Prune Juice Smoothie, Soda, Chai Tea & Hot Chocolate! When it comes to eating healthy, we know that the foods we put into our bodies are important. But, our bodies also have to be able to properly break down the food we eat, so we can actually use those nutrients as fuel. That’s why, today, I’m sharing 5 tasty drinks for digestion that are specially crafted to support a healthy digestive system! Of course, we want to fill our diets with gut-friendly foods—particularly real, whole foods. What we eat regularly has the greatest impact on our overall health! But, we can also give our gut a healthy boost and help to keep our system regular by including drinks for digestion in our daily health routine. For one thing, many of us don’t take into account how sugary sodas or artificially-sweetened drinks can wreak havoc on our gut. And replacing those with gut-friendly drinks can make a huge difference. Naturally, water is always a great choice for our bodies, and most of us don’t drink enough of it! But, these drinks for digestion feature a special (and delicious) high-fiber ingredient that can help with regularity: Sunsweet® Amaz!n™ Prune Juice! What is Fiber? & What Does Fiber Do? Basically, fiber is a type of carbohydrate that the body can’t digest. Dietary fiber comes from plant matter—like fruits, veggies, whole grains, and beans—and it passes through the digestive system relatively intact. But, since fiber isn’t broken down and digested, fiber is an all-star in terms of digestive health and keeping us regular. In simplest terms, that fiber hangs out in the digestive system, not getting absorbed, and bulks up the stool so it’s easier to pass. We all need fiber, and the more plant-based foods we eat, the more fiber we’re getting. So, if you’re having digestive issues, the best natural remedies for constipation are definitely eating more fruits and veggies. 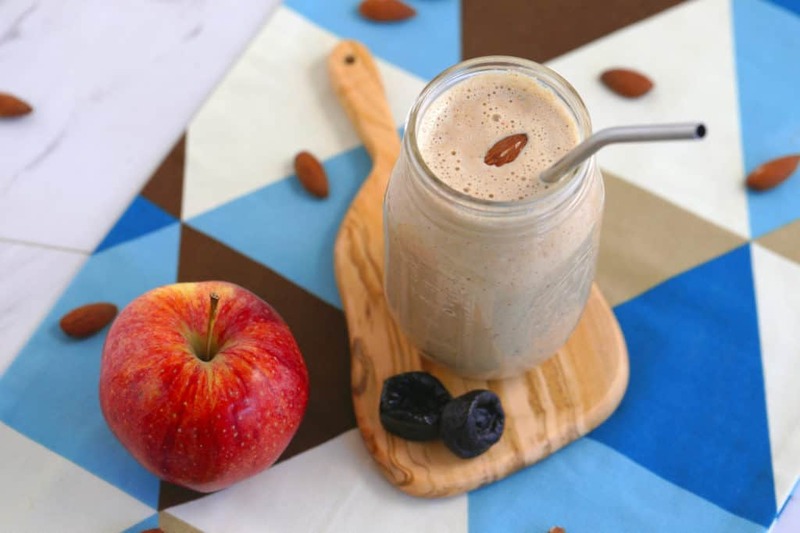 Or, you can give your body a fiber boost with these drinks for digestion, featuring nutritious, fiber-filled prune juice! What is Prune Juice? Can it Actually Help with Digestion? In case you don’t know, prunes are just dried plums. And they’re deliciously naturally sweet—as is prune juice! 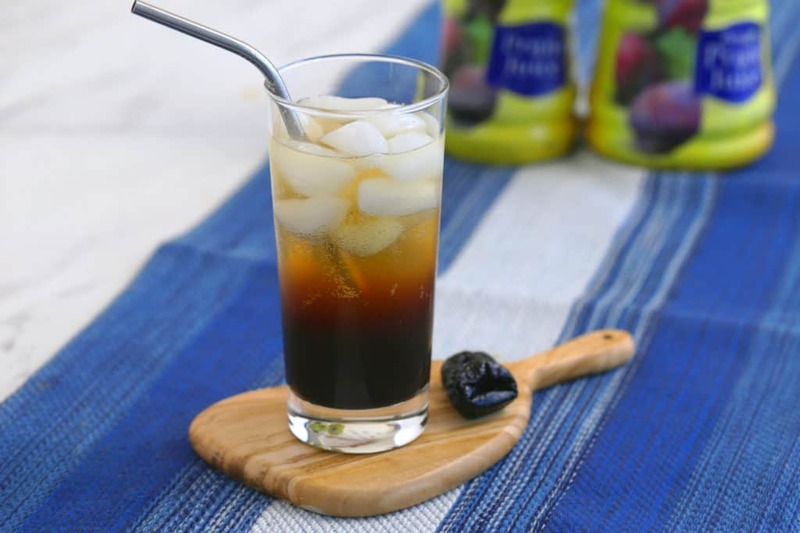 The main reason that I love Sunsweet® Amaz!n™ Prune Juice is because it tastes amazing, has no added sugars, and is made from just 1 ingredient: 100% prune juice. And both prunes and prune juice are chock-full of dietary fiber! (Hence, why most people think of eating prunes or drinking prune juice for constipation.) Prunes tend to contain more fiber than prune juice, since the prunes are juiced and then the juice is filtered, which removes much of the fiber. But, just 1 cup of Sunsweet® Amaz!n™ Prune Juice contains 3g of dietary fiber—which is 12% of your recommended daily value! (And, that’s as much fiber as 5 prunes contain.) Plus, there’s a fair amount of research to support why prune juice has earned a reputation as one of the best drinks for digestion. There are studies showing both prunes and prune juice can alleviate and prevent constipation, and that they may even prevent colon cancer. Even more impressive, some studies have shown that prunes and prune juice can be more effective than other constipation-relieving medications or natural remedies! 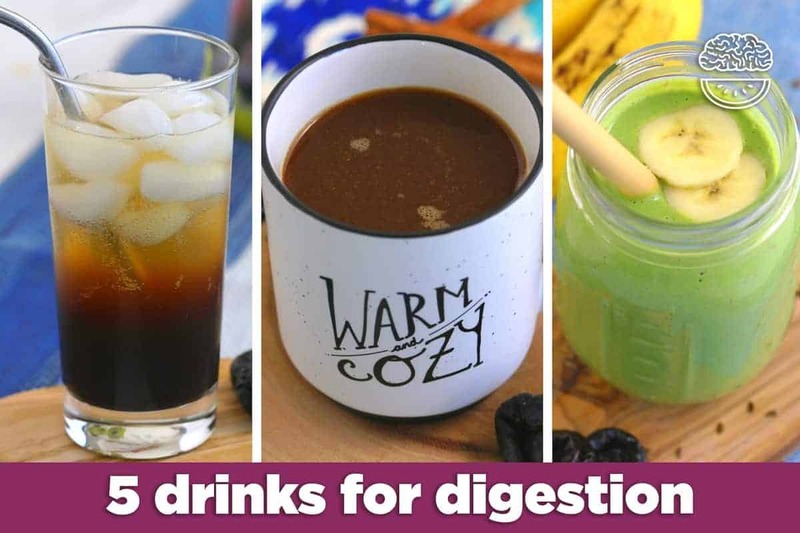 Whether you’ve never tried prune juice or are looking for ways to fit more high fiber drinks into your diet, give these simple drinks for digestion a try! Most take 5 minutes or less to prepare, and you can customize them however you like to suit your taste buds—and your gut. I hope you enjoy, and leave a comment to let me know which is your favorite! Carbonated Water—provides hydration (just like non-carbonated water), which is crucial to digestion, and some studies have shown that carbonated water specifically can aid in digestion. Lemon Juice—detoxifies and helps clean the liver to keep digestion healthy, while also protecting the body from immune system deficiencies. Prune Juice—rich in dietary fiber, which adds to the digestion-aiding power of this hydrating drink! Method 1: To keep this recipe as easy as possible, simply pour your sparkling water and prune juice into a glass over ice. Method 2: For a fun, subtle flavor twist, pour your prune juice into an ice cube tray and freeze—then add frozen juice cubes to a glass, pour over your sparkling water, and watch your fruity cubes melt into a deliciously fizzy refresher! Apple—rich in pectin, a type of soluble fiber that helps digestion and decreases inflammation. Since the skin of the apple is what contains that pectin, leave it unpeeled! Plain Yogurt—rich in probiotics, which help to feed healthy gut bacteria. Prune Juice—provides natural sweetness from whole foods, instead of the traditional added sugar or sweeteners often included in smoothies! Pour into a glass, serve, and enjoy! *Nutrition provided for smoothie made with plain unsweetened Greek yogurt. Banana—contains fiber which helps with digestion, and also restores electrolytes and potassium to keep our digestive system balanced. Pineapple—helps to reduce bloat and alleviate constipation. Spinach—like other leafy greens, an excellent source of fiber, essential micronutrients, and helps to fuel the growth of healthy gut bacteria! Ground Flaxseed—an amazing source of soluble fiber AND plant-based omega-3 fatty acids. Just be sure to use ground flaxseed, not whole flaxseeds, since the body can’t digest the seeds whole. Yogurt—probiotic superstar that helps to keep our healthy gut bacteria in balance. Prune Juice—packs in natural sweetness and a boost of fiber! Fennel Seeds—rich in fiber and helps to relax the digestive tract, which can help reduce uncomfortable symptoms like bloating and cramping. Fresh Ginger—helps to reduce gut inflammation and enhances nutrient absorption! Also, helps to speed up food’s movement through the stomach, which can ease the side effects of slow digestion. Prune Juice—packs dietary fiber into your cup of tea, and naturally sweet enough that I don’t think you even need to add any sweetener! Add Sunsweet® Amaz!n™ Prune Juice, water, crushed fennel seeds, crushed ginger, and cinnamon to a pot and bring to a boil. Turn down heat and simmer for 2-3 minutes. Remove pot from heat, add chai teabag, and steep 4 minutes (or according to your package directions). Remove tea bag and strain mixture through a fine mesh sieve. Transfer strained tea to the cup of your choice. Add sweetener to taste and a splash of coconut milk (if desired) before serving and enjoying! 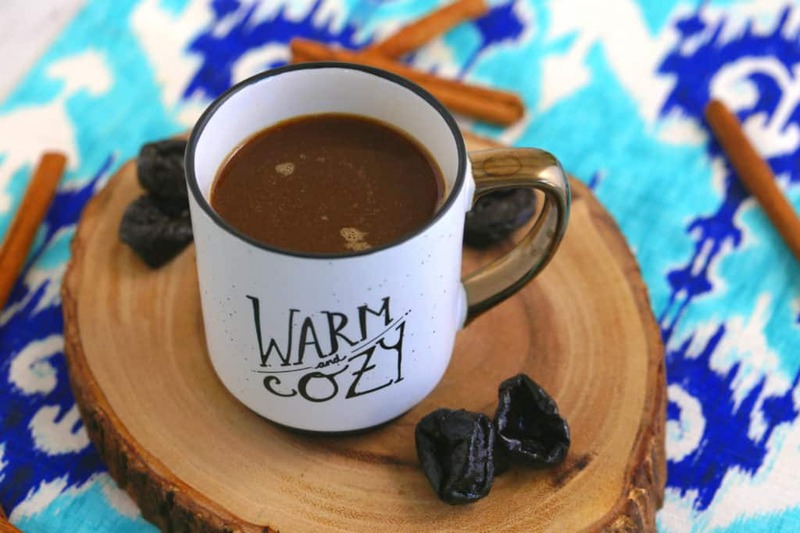 *Nutrition provided for Spiced Prune Chai recipe made with a natural no-calorie sweetener and 1 Tbsp full-fat coconut milk. Hemp Milk—rich in omega-3s which can aid in digestive health. Cocoa Powder—especially dark, unsweetened cocoa powder: contains flavanols that can become a prebiotic when digested, and prebiotics work with probiotics to balance the bacteria in your gut! Cayenne—has been used for centuries and across cultures to aid in digestive health. It stimulates the digestive tract, can ease stomach aches and nausea, and can even help to heal ulcers or other serious digestive conditions with its potent anti-inflammatory compounds. Prune Juice—cuts down on the need for added sugars and adds 1.5g of fiber to a usually fiber-less drink! Transfer mixture to a sauce pan and heat to a light boil or simmer, stirring occasionally, until warmed through. 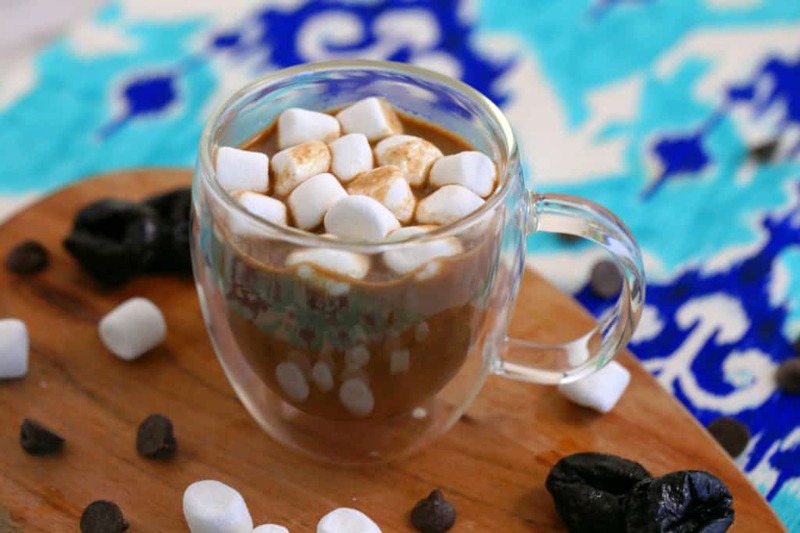 Serve, top with marshmallows if desired, and enjoy! *Nutrition provided for hot chocolate recipe made with unsweetened hemp milk and 1 tsp maple syrup. Does not include optional marshmallow topping. Bone Broth Benefits: The Immune-Boosting Superfood! 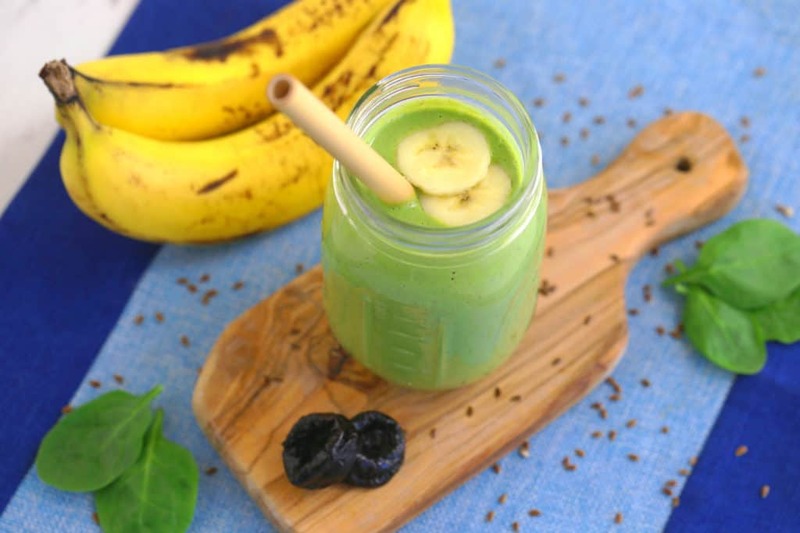 Concentrates, Juices & Smoothies: How To Make Healthy Choices! FAN REQUESTED VIDEO!